George Graham Bela Fleck and Abilgail Washburn's "Echo in the Valley"
If there is anyone who has come to be identified with the banjo in recent years, it’s Béla Fleck. Usually associated with bluegrass, or early jazz, the banjo, under Fleck’s auspices has become part of jazz-rock fusion with his Flecktones group, straight jazz in duos with Chick Corea, classical, and world music, through Fleck’s field trips to Africa and elsewhere. Béla Fleck started got into bluegrass banjo as a teen in New York, but soon saw the instrument’s possibilities, becoming a part of the cadre of instrumental iconoclasts who launched the New Acoustic scene in the 1980s. Fleck spent several years with the influential and popular band New Grass Revival with Sam Bush. Fleck has made a career of his interesting collaborative projects with musicians usually outside the stylistic realms one associates with banjo. Along the way, he has won Grammy Awards in more different categories than any other instrumentalist. But over the last few years he has been working with someone with whom he is quite compatible, his wife, Abigail Washburn, who is another banjo player. Their new joint album is called Echo in the Valley. Fleck met Washburn at a square dance in Nashville, where he was playing and she was dancing. They soon hit it off, and Fleck produced Washburn’s first album. Ms. Washburn also has an interesting career. She is a member of the band Uncle Earl, and has been a kind of ambassador for the banjo, working especially in China and the Far East. She speaks fluent Mandarin. She has presented a TED Talk called “Bridging US-China Relations by Banjo” which has been viewed over a million times on-line. Fleck and Washburn have been married since 2013 and have been touring the world together, with time out to care for their young son Juno, who is pictured with a banjo on their 2014 album called Béla Fleck and Abigail Washburn. Now they are out with Echo in the Valley, which continues their distinctive collaboration with most of the album being two just banjos, albeit sometimes banjo variations, including a cello banjo and an antique bass banjo, along with Ms. Washburn’s vocal. But while the sound may seem a little sparse, the music has a surprising degree of richness and musical detail. Unlike their previous album which drew on some traditional music, the material on the new release is almost all original. But with the two-banjo setting, their compositions mostly sound like traditional music from both sides of the Atlantic. Their lyrics often address what could be considered current issues with a degree of subtlety. Needless to say, the playing is nonpareil, though there is a kind intentional back-porch quality to the setting. Between them, they used fifteen different banjos. 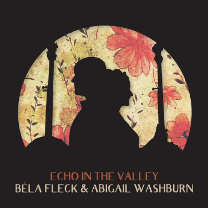 Echo in the Valley, the new album by the husband-wife duo of banjo players Béla Fleck and Abigail Washburn is another memorable recording by two people who have done much exploration with their instrument, Fleck with his stylistic amalgams, and Washburn through her cultural exchanges especially in the Far East. The first time they worked together on an album, the question was how could just two banjos pull off a full album and keep it interesting. They certainly proved that back in 2014 with their eponymous release. Their new followup goes beyond just the novelty of two banjos together, and features almost all original material, most of it first rate. Fleck is acknowledged as one of the best banjo players on the planet and a skilled and wide-ranging composer. Ms Washburn is no slouch on the five-string and shows her skills on the cello and bass banjos, as well as being a fine vocalist. Our grade for sound quality is an “A.” Fleck’s recordings have traditionally had good high integrity. Fleck himself mixed the album. Like Fleck and Washburn’s last album, you don’t have to be a die-hard banjo fan to find yourself enchanted by Echo in the Valley.